Chipping concrete in industrial floors happens frequently, especially when heavy items drop to the industrial concrete floor. Installing a concrete protection layer can certainly minimize the effects of repeated impacts, but does not eliminate chipping concrete all together. It is important to repair chips in the industrial concrete floor so that chip does not become a weak point in the concrete flooring system. 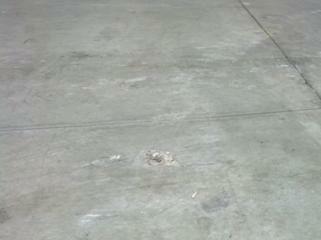 Concare repairs chips, cracks, flaking, scaling and pitting in industrial concrete floors. Concare can restore your industrial concrete floor regardless if the chip is small or if the chip is deep and wide. We will utilize high quality materials combined with our experience to match the chipping in the concrete floor with the most effective repair materials. Our goal is to ensure a long lasting concrete floor that retains its durability and longevity. Contact Concare today to repair chipping in your industrial concrete floor.